Trailers are very different ‘beasts’ than their tow vehicles. Their moving parts – axle, wheels, hubs, lighting get abused through through the multiple dunkings in water … the worse offender being saltwater … and neglect. 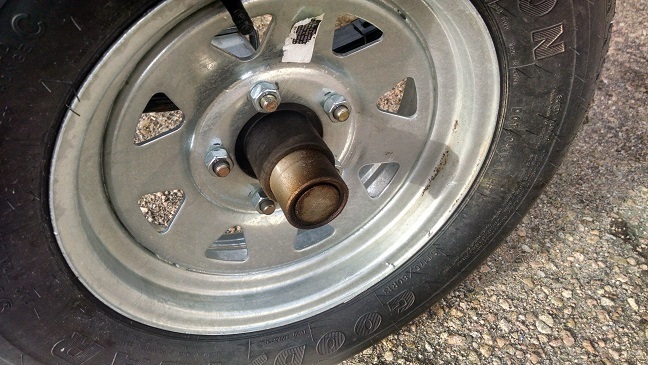 As a result it is up to you as a trailer owner to keep a close eye on your boat’s ‘road wheels’. In this post I’ll be covering trailer hubs. Hubs take a lot of abuse. Two primary forms of hub abuse are being dunked in water, as mentioned before, resulting in contaminated lubrication grease and the heat caused by friction when going down the road. A well adjusted hub packed, or filled, with good quality grease will provide years of service. If you keep a schedule of ‘repacking’ (ie, taking apart the hub for cleaning and new grease) the metal parts of the hub will likely last ten or more years. The rubber seals will need replacement … usually done when the hub is re-packed. The first thing to ‘hub health’ is assuring the hub’s grease is plentiful and clean. I recommend the use of a ‘hub protection system’. I am a fan of BearingBuddy and the Vault products. Both of these systems work on the principle that an excess quantity of grease is stored under a small amount of pressure (2 or 3 PSI). This means that as the grease expands, contracts, or a small quantity leaks out (see below about leaking grease) new grease is pushed into the hub assembly. BearingBuddy are easy to install and add grease. All you need is a grease gun that will hook onto the Zerk fitting. You check the hub grease by pushing on the piston. If it moves you have enough grease. That simple. The usually failing with BrearingBuddy is when someone pumps to much grease into the fitting and blows out the hubs rear seal. 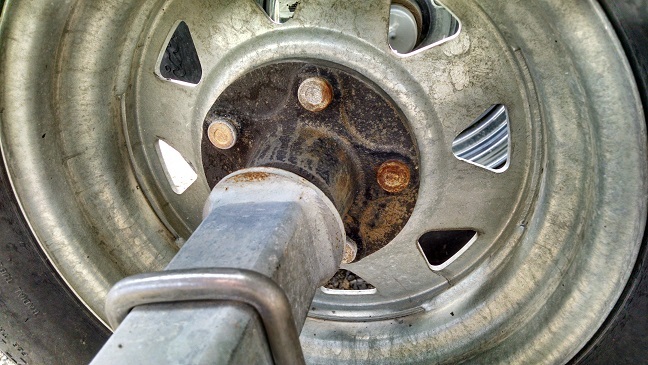 It is easy to see when this happens as grease will be seen all over inside of the wheel rim. Vault is maintenance free fully sealed system. The warranty is for five years. No servicing is required. 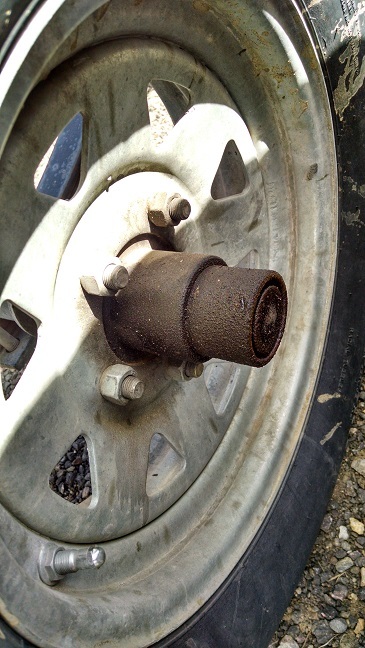 All you do is check the wheel for signs of leaking grease and that the hub itself isn’t loose. Checking the hub to see if it is loose? What does that mean? Hubs should not spin freely. They should have just a little drag caused by the lubricating grease. Test your hubs at least once a year by jacking up the trailer, be sure you block the trailer so it will not roll or fall, and give each wheel a spin. The wheel should slowly come to a stop with no loud grinding noises. If it seems to ‘spin forever’ or sounds like it is filled with gravel, the hub needs servicing. The next thing to check for ‘loose hubs’ is if the hub can be rocked side-to-side. Again, before doing this make sure the trailer is safely blocked so it will not fall. Grab the wheel with both hands and give it a strong wiggle. 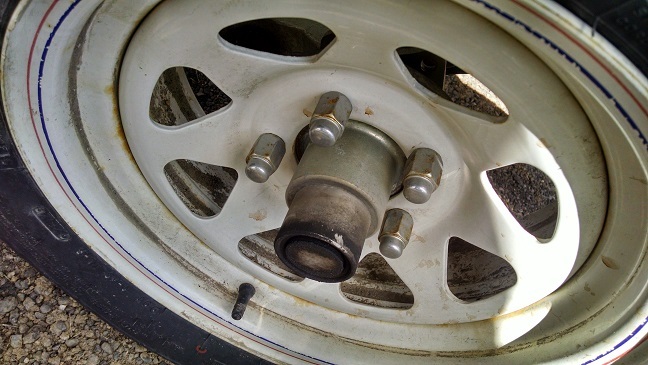 The hub should not move side-to-side nor make a clunking noise. If the above to tests make you question the hub(s) condition it is time for servicing. Paying a trailer shop to do this is about $200 per hub. It is a messy, though not difficult, job to repack and adjust a trailer hub. A www-search (recommended search term: ‘repacking trailer hubs’) will result in many instructional pages & videos. A BearingBuddy fitting after about 400 miles. As you can see it ‘leaks’. This BearingBuddy has been used for about 8,000 miles. 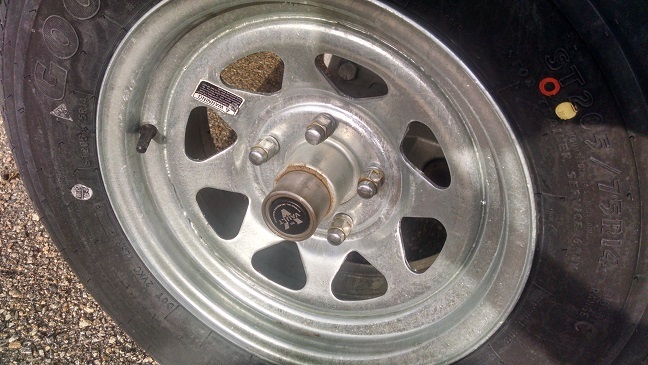 This wheel has traveled about 20,000 miles. The BearingBuddy fitting leaks just a bit of grease and makes a mess. This is the inside of the 20,000 mile hub. Even though the outside is greasy from the slow leak at the BearningBuddy fitting (other side of wheel, picture above) the hub seals are not leaking and the hub is in good condition. BearingBuddy work great … but even when doing their job there is a mess. A vault protected hub will not leak grease. See how clean this hub and wheel are after 3000 miles. The Vault system runs cleaner. My experience is you only see some dust that attaches the the thin film of grease that remains after the fitting was wiped off after installation. In my opinion this ‘lack of dirt’ shows that the Vault fitted hubs are better sealed resulting in little contamination to the lubricating grease. When you check you trailer hubs look for excessive amounts of grease that has been thrown onto the outside and inside of the rim. I have seen a hub gasket, or seal, failure fling grease onto the sides of the boat and the trailer frame. The final thing you should do to assure your hubs in good condition is checking their temperature when you stop to get gas, utilize Rest Area facilities, and arrive at the boat launch. To check their temperature place the back of your hand near, NOT TOUCHING, the hub. Do you feel any heat? The hub should be slightly warm but NOT HOT. You should be able to touch a hub just after you stop … DO NOT grab the hub as if it overheated you will be severely burned!! This is why you first put the back of your had NEAR the hub. In summary check your hubs every time you stop for excessive leaking grease and excessive heat. At least once a year jack up the trail and confirm the hubs are correctly adjusted. After four of five years of service consider repacking the hub assembly with new grease, replacing the seals and inspecting the internal metal parts for wear.